with just 23 years, and it is one of the most promising pianists of his generation. 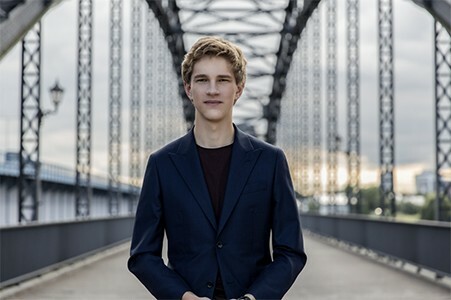 Canadian Jan Lisiecki will do the last concert of the season Cycle Great Performers of Scherzo Foundation which he has brought together great masters of piano with outstanding young artists. This exclusive concert musician Deutsche Grammophon will take place on Tuesday 11 December at 19:30 hours at the Auditorio Nacional de Música in Madrid. They will ring works of Bach, Chopin One of its composers predilectos-, Beethoven, Mendelssohn y Rachmaninov. The artist noted for his extraordinary interpretative maturity, distinctive sound and poetic sensibility. Subtle interpretations, with refined techniques and a natural artistic affinity, They give a musical voice that belies its age. Madrid concert will be the second of a tour of Spain including Girona (10 from December, Girona Auditorium) and Alicante (12 from December, Main auditorium). Born in Calgary 1995, Polish parents, Jan Lisiecki began studying piano at age five and although he made his orchestral debut at nine, He has always rejected the label "wunderkind". His approach to music is a combination of dedication, skill and enthusiasm, plus a realistic perspective on the career of a musician. “You might be lucky enough to have talent, but it is also about dedication and hard work“, has declared. His contract with Deutsche Grammophon in 2011, to the 15 year old, He confirmed its status among the most imaginative and poetic pianists of his generation. Jan Lisiecki drew international attention 2010, after the Fryderyk Chopin Institute launched a recording of Chopin piano concertos, played live by him at the age of 13 Y 14 years. The album received the prestigious Diapason Découverte. Deutsche Grammophon hired exclusively on 2011. His first recording for this stamp, in 2012, included piano concertos K.466 and K.467 Mozart; followed, in 2013, for the Etudes on. 10 Y 25, Chopin. His third album was released in January 2016 with works by Schumann. His recent works include works for piano and orchestra by Chopin with NDR Philharmonic Orchestra Elbe and Krzysztof Urbanski. It acts with major orchestras around the world, como the Orchester de Paris, New York Philharmonic and the BBC Symphony; in places like Suntory Hall, Kennedy Center, Lincoln Center, Barbican and the Royal Albert Hall; and directed by teachers as Pappano, View-Séguin, Harding y Zukerman. It debuted at Carnegie Hall in 2016 y con la Philadelphia Orchestra View-Séguin. In season 2015/16 he performed with the Bamberg Symphony Orchestra in Lucerne, He first performed with the Cleveland Orchestra and San Francisco Symphony, and made tours -including one in Europe with the Zurich Chamber Orchestra- that led from the piano. In season 2016/17, He acted worldwide, including a tour with the London Philharmonic he brought to Spain by Jurowski. also he participated in the festival opening performance of the new Elbphilharmonie in Hamburg Nézet-Séguin with. Among the engagements this season include performances in the US with the Indianapolis Symphony Orchestra and Urbański, recitals in Hong Kong and Beijing, concerts in Hamburg with the NDR Orchestra of the Elbe Philharmonic Hall or Berlin, with the Royal Philharmonic Orchestra and Lionel Bringuier, among many others. Lisiecki concert will be the last of the 23rd season of Great Performers Series of the Scherzo Foundation. Along the 2018, pianists Mitsuko Uchida extensive experience as, Grigory Sokolov or Radu Lupu have shared the stage with talented young artists as Yuja Wang, B. Abduraimov o Benjamin Grosvenor; in addition to the extraordinary concert offered by director Gustavo Dudamel and the Mahler Chamber Orchestra, and mezzosoprano Cecilia Bartoli of with La Cenerentola. The ticket price is set from the 25 euros. Young people under 26 years may attend concerts 10 euros if they attend the National Auditorium box office half an hour before the start of the concert. Throughout more than two decades of life of this cycle sponsored by El País and Cadena Ser, They have acted almost a hundred pianists in more than 200 concerts. These figures have become one of the best in their specialty cycles at European level. Sonata nº14, on. 27, nº2 "Claro month"